We get a little freaked out when movies are too real. Did you ever see that one where the guy is caught under a rock in the desert? So disturbing. And the most terrifying part was that it was based on a true story, so we knew that it couldn't be just a bad dream. 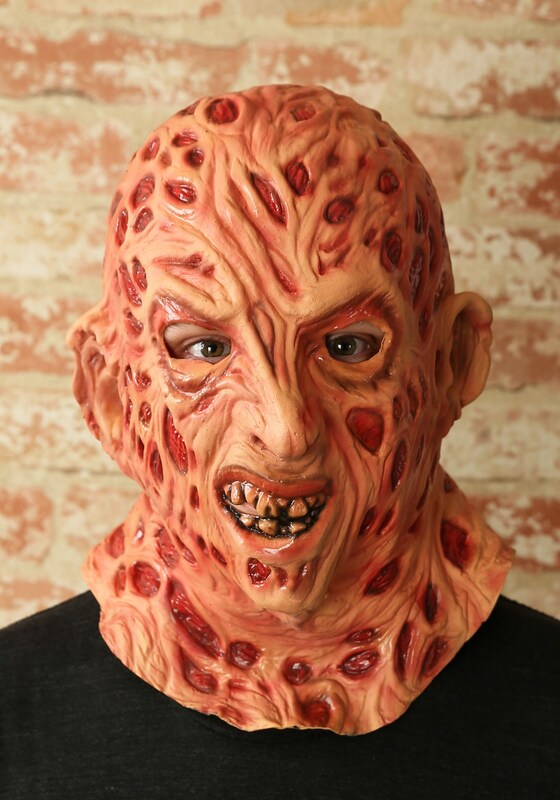 That's what makes this gruesome Freddy Overhead Mask so frightening. Even if we decide to stop watching A Nightmare on Elm Street, someone could show up to the party in this realistic mask and scare the living sleep out of us! This detailed headpiece has openings for the eyes of its wearer, but the rest is covered in Freddy's warped skin and horrifying lesions. With some bladed gloves and Freddy's signature hat, everyone might keep their distance at first. But they'll have to come closer to admire the impressive natural rubber latex construction of this official mask.